ACCEDED, BAGGAGE, CABBAGE, DECEDED, DEEDEED, DEFACED, DEFADED, DEGAGEE, EFFACED, GEAGGED, and FEEDBAG are seven-letter words which can be played on a musical instrument. CABBAGED, BEBEDDED, BEDEAFED, DEBADGED, DEBAGGED, and BAGGAGED are eight-letter words. If you allow hyphens, there are CABBAGE-BED, BEADED-EDGE, and FACE-BEDDED. CABBAGEFACED, although not in dictionaries, is a longer such word [Stuart Kidd, Philip Bennett, Joseph Krol, Paul Wright]. The Hungarian words újjáépítéséről ("about its reconstruction") and újjáválaszthatóságáról ("about his/her re-electability") have seven accent marks. Also in Hungarian, alelölülő means "deputy chairperson" (lit. : "deputy fore-sitter"), although this is a made-up word that is not in use. Some words with five accent or diacritical marks are hétérogénéité (French for "heterogeneity") and Héréhérétué (an atoll in the Pacific Ocean near Tahiti). In Hungarian, a word which is widely used to test whether the diacritical marks remain intact (e.g. in sending an e-mail) is árvíztűrő tükörfúrógép ("flood-proof mirror drilling machine"). This is probably the shortest text which contains all the possible accented letters in Hungarian [Ádám Szegi, Tamas Lepesfalvi, Stuart Kidd]. ADCOMSUBORDCOMPHIBSPAC is the longest acronym in the 1965 edition of the Acronyms, Initialisms, and Abbreviations Dictionary. It is a Navy term standing for Administrative Command, Amphibious Forces, Pacific Fleet Subordinate Command [Dickson]. Another acronym, PUMCODOXPURSACOMLOPAR, stands for "pulse-modulated coherent Doppler-effect X-band pulse-repetition synthetic-array pulse compression lobe planar array" (from Willard Espy). COMSUBCOMNELMCOMHEDSUPPACT (26 letters) stands for Commander, Subordinate Command, U.S. Naval Forces Eastern Atlantic and Mediterranean, Commander Headquarters Support Activities [Charles Turner]. However, the world’s longest acronym according to the Guinness Book of Words is NIIOMTPLABOPARMBETZHELBETRABSBOMONIMONKONOTDTEKHSTROMONT (56 letters, 54 in Cyrillic). Found in the Concise Dictionary of Soviet Terminology, it means: The laboratory for shuttering, reinforcement, concrete and ferroconcrete operations for composite-monolithic and monolithic constructions of the Department of the Technology of Building-assembly operations of the Scientific Research Institute of the Organization for building mechanization and technical aid of the Academy of Building and Architecture of the USSR [Stuart Kidd]. According to the Encyclopaedia Britannica (15th ed.) PAKISTAN is an acronym for the five Northern units of India - Punjab, North-West Frontier (Afghan) Province, Kashmir, Sind and Baluchistan, and was coined in 1933 by Choudhary Rahmat Ali (1895-1951). However, according to the World Book Encyclopedia (1976), Pakistan means "land of the pure" in Urdu [Charles Turner]. AEGILOPS (alternate spelling of egilops, an ulcer in a part of the eye) is apparently the longest word in W2 which consists of letters in alphabetical order. Aegilops is also also a genus of mollusc and a genus of grass [Charles Turner]. CHILLLOSS (the opposite of a heatloss) has its letters in alphabetical order, although this word may not be in any dictionary [Word Ways]. BEEFILY and BILLOWY are the longest such words in OSPD2+. Update: Mike Turniansky reports that new six-letter words with the letters in alphabetical order added to the Scrabble dictionary in 2014 are: AGLOOS, BLOOPY, DEHORS, DHIKRS, GLOOPS, and GLOOPY. Seven-letter words from the OED2 with their letters in alphabetical order are: ACCENTY, ACCOMPT, ADDILLS, AFFORST, ALLOQUY, BEGHOST, BELLOOT, DEGLORY, FILLOPS, and FILLOTT [Philip Bennett]. Six-letter words with their letters in alphabetical order include: ABBEIT, ABBESS, ABBEST, ABDEST, ABHORS, ACCENT, ACCEPT, ACCESS, ACCLOY, ACCOST, ACHILL, ACKNOW, ADDEEM, ADDERS, ADEMPT, ADHORT, ADILLS, ADIPSY, ADORTY, AFFLUX, AGHILL, ALMOST, ANOPSY, BEFIST, BEFLOW, BEGILT, BEGINS, BEGIRT, BEKNOW, BELLOW, BENOTT, BIJOUX, BILLOT, BIOPSY, BLOOPS, BLOTTY, CHILLS, CHILLY, CHIMPS, CHINNY, CHINTZ, CHIPPY, CHIRRS, CHITTY, CHIVVY, CHOOPS, CHOOSY, CHOPPY, CLOOPS, CLOTTY, DEFLOW, DEFLUX, DEHORT, DIKKOP, DILUVY, DIMPSY, EFFLUX, EFFORT, ELLOPS, FILMOT, FLOORS, FLOPPY, FLOSSY, GHOSTY, GILLOT, GLOPPY, GLOSSY, GOOSSY, KNOPPY, and KNOTTY [Philip Bennett, Bruce D. Wilner, Mike Turniansky, Denis Borris, Stuart Kidd, Eric Brahinsky]. The following words in the on-line Scrabble dictionary have symmetrically distributed letters: WIZARD, HOVELS, BEVY, GIRT, GRIT, IZAR, LEVO, TRIG, VOLE, WOLD, BY, LO, and SH [Mark D. Lew, Dan Tilque, Bruce D. Wilner]. There is also ZYBA (a town in Kansas), which was named by taking the last two letters and the first two letters of the alphabet [Don Blevins in Peculiar, Uncertain & Two Egg]. POLK is the only last name of a U. S. President with symmetrically distributed letters. “Symmetrically distributed letters” means that, for example, in BEVY the B and Y are equidistant from the center, as are E and V. Kieran Child points out that if you allow the central letter to be a “pivot” then the word BIGOTRY works and is even longer than wizard and hovels. ASTHMA begins and ends with a vowel and has no other vowels in between. Some less common words of six or more letters with this property are ACHCHA (a S. Asian expression meaning "is that so"; newly in the OED: "to express agreement"), ANDHRA (an Indian State), ANGSTY (adjective of angst), APHTHA (OSPD3), ARCHLY, ARCHLY, ARCHSPY, ELTCHI (SOWPODS), ICHTHY, ISTHMI (alternate plural of isthmus), ORCHHA (an Indian State), ORMSBY (name of several towns in the U. S.), ORPHNE (Greek nymph in Hades). There are also these obsolete or obscure words from the OED2: ARMTHE, ERMTHE, ARCTLY, ARGHLY, ENGHLE, ESSSSE, ERSHRY, ERSTLY, IRSCHE, UNCKLE, USSCHA, and USSCHO [Mike Turniansky, Mark D. Lew, Stewart Kidd, Philip C. Bennett, Yarlagadda Police]. Some two-syllable words which become one-syllable words by adding a letter or letters are: AGUE/PLAGUE, AGUE/VAGUE, AVE/CAVE, AVE/HAVE, RUGGED/SHRUGGED, AGED/RAGED, AGED/STAGED, BOA/BOAT, OLE/SOLE OLE/WHOLE, RAGGED/DRAGGED, NAKED/SNAKED, SOUR/SOURCE, WINGÉD/TWINGED [Stuart Kidd, Dan Tilque]. Some common words which change from one to three syllables upon the addition of just one letter are: ARE/AREA, CAME/CAMEO, CRIME/CRIMEA, GAPE/AGAPE, HOSE/HOSEA, JUDE/JUDEA, LIEN/ALIEN, OLE/OLEO, RODE/RODEO, ROME/ROMEO, SMILE/SIMILE and WHINE/WAHINE. (Wahine is defined as a Polynesian woman or a female surfer in MWCD11.) There are numerous other examples involving more obscure words [Jim Lizzi, Stuart Kidd, Philip Bennett, Charles Turner]. ANHUNGRY is one answer to the question, "What’s the other word besides 'angry' and 'hungry' that ends in 'gry'?" This is the most frequently asked question of the editors of Merriam-Webster. Actually, "angry" and "hungry" are the only two words in common use ending in -gry, but quite a few obsolete or obscure words can be found in unabridged dictionaries. Among them are ANHUNGRY, used by Shakespeare, and AGGRY BEAD, both of which are in W3. The only -GRY words in RHUD2 are ANGRY, HUNGRY, HALF-ANGRY, OVERANGRY, and UNANGRY. Chambers has AGGRY (an adjective describing certain ancient West African beads) and AHUNGRY (oppressed with hunger). OSPD has PUGGRY (a variant form of the more usual PUGGAREE, a scarf wrapped around a sun helmet). The OED has angry, an-hungry, begry, conyngry, gry, higry pigry, hungry, iggry, meagry, menagry, nangry, podagry, skugry, unangry. Buckminster Fuller coined the word LIVINGRY as the opposite of weaponry, which he called KILLINGRY [Charles Turner]. On Jan. 2, 2012, a Tampa Tribune columnist wrote, “Why does ‘Youngry’ just get to go on Raheem’s tombstone?” He was referring to Raheem Morris, the head coach of the Tampa Bay Buccaneers football team, which had just concluded a losing season with young players. In Dutch, there are jij (you), pijjekker (pea-jacket, although not found in dictionaries), schrooiijzer (upstanding cutting iron for bars, rods), sjiiet (follower of the Shia), snijijzer (cutting iron), uitdijing (expansion), and zijig (effeminate) [Oscar van Vlijmen, René Davids]. In Lithuanian, jiji is an archaic Lithuanian form of "him" consisting exclusively of dotted letters, and kraujijimas is archaic for "staining with blood" [Juozas Rimas]. In Swahili, jiji means "city" and kijiji means a small city or village [Gerald Gathuto]. In Hungarian, jöjjön (meaning "he should come") has seven dots in a row [Maryam Frazer]. In Finnish, pääjääjää (meaning "the main stayer," partitive case) has 14 dots in a row, according to Pertti Malo, who writes that a person at the Research Institute for the Languages of Finland "writes to me that 'in theory' she would approve this word." Malo writes that there are so many ways to create a Finnish word that it would be impossible to collect them all in a dictionary. A website (in Finnish) estimate there are 1024 Finnish words. A property development company in the Canadian territory of Nunavut is the Katujjijiit Development Corporation, with six consecutive dotted letters [Craig Rowland]. The earliest known use of CATENARY in English is by President Thomas Jefferson. He also is thought to have coined NEOLOGIZE, BELITTLE, ANGLOPHOBIA, ODOMETER, OTTOMAN, and PEDICURE [Thomas Dickson, Words from the White House; Charles Turner]. The earliest known use of MILEAGE is by Benjamin Franklin. Barry Harridge reports that in Chambers the eight spellings of CATERCORNER are surpassed by the number of variants for GALLABEA which can also be spelled gallabeah, gallabia, gallabiah, gallabieh, gallabiya, gallabiyah, gallabiyeh, galabea, galabeah, galabia, galabiah, galabieh, galabiya, galabiyah, galabiyeh. Friederike E. Droegemueller adds these spellings: Djellabah, Jellaba, Djallabea, Jalaba, Djelaba. She writes, "I saw all of these spellings, and more, in Morocco. It is, by the way, the same garment, regardless of spelling." Eric Brahinsky has found that W3 gives twelve spellings for the plural of Haftarah (the singular of which has four spellings shown). The plurals are: HAFTAROTH, HAFTAROT, HAFTARAHS, HAPHTAROTH, HAPHTAROT, HAPHTARAHS, HAFTOROTH, HAFTOROT, HAFTORAHS, HAPHTOROTH, HAPHTOROT, and HAPHTORAHS. Gloria Donen Sosin says she has found 16 spellings for HANUKKAH (in alphabetical order): Channuka, Channukah, Chanuka, Chanukah, Chanuko, Hannuka, Hannukah, Hanuka, Hanukah, Hanukkah, Kanukkah, Khannuka, Khannukah, Khanuka, Khanukah, and Khanukkah. (Her list may include transliterations from Hebrew to English.) James A. Landau has found Chanuccah in an 1872 prayer book. The name MUAMMAR KHADAFI has 32 variants according to the Library of Congress. (1) Muammar Qaddafi, (2) Mo'ammar Gadhafi, (3) Muammar Kaddafi, (4) Muammar Qadhafi, (5) Moammar El Kadhafi, (6) Muammar Gadafi, (7) Mu'ammar al-Qadafi, (8) Moamer El Kazzafi, (9) Moamar al-Gaddafi, (10) Mu'ammar Al Qathafi, (11) Muammar Al Qathafi, (12) Mo'ammar el-Gadhafi, (13) Moamar El Kadhafi, (14) Muammar al-Qadhafi, (15) Mu'ammar al-Qadhdhafi, (16) Mu'ammar Qadafi, (17) Moamar Gaddafi, (18) Mu'ammar Qadhdhafi, (19) Muammar Khaddafi, (20) Muammar al-Khaddafi, (21) Mu'amar al-Kadafi, (22) Muammar Ghaddafy, (23) Muammar Ghadafi, (24) Muammar Ghaddafi, (25) Muamar Kaddafi, (26) Muammar Quathafi, (27) Muammar Gheddafi, (28) Muamar Al-Kaddafi, (29) Moammar Khadafy, (30) Moammar Qudhafi, (31) Mu'ammar al-Qaddafi, (32) Mulazim Awwal Mu'ammar Muhammad Abu Minyar al-Qadhafi [Charles Turner]. David Fabian performed a Google search using various spellings on Dec. 20-21, 2003, and found the following number of hits for each: Gaddafi, 60600; Gadaffi, 26800; Qaddafi, 23900; Khadafi, 18300; Gadhafi, 17600; Kadhafi, 17000; Kadafi, 14300; Qadhafi, 12900; Kaddafi, 10000; Gadafi, 6910; Ghaddafi, 4310; Khaddafi, 3920; Khadafy, 3890; Khadaffi, 2840; Ghadafi, 2550; Qadaffi, 2200; Ghadaffi, 2070; Gadafy, 1760; Kadaffi, 1490; Qadafi, 1450; Khadaffy, 1350; Gaddhafi, 897; Gaddaffi, 861; Khaddafy, 802; Gaddafy, 670; Ghadhafi, 462; Gadhaffi, 442; Qaddaffi, 381; Qaddhafi, 304; Khadhafi, 289; Kadafy, 270; Gadaffy, 245; Kaddhafi, 196; Kaddaffi, 187; Kadhaffi, 181; Kadaffy, 178; Ghaddaffi, 156; Khaddaffi, 133; Qaddafy, 129; Kaddafy, 127; Ghadafy, 121; Ghaddafy, 114; Qhadafi, 101; Qadhaffi, 98; Qadafy, 86; Qadaffy, 72; Kadhafy, 71; Khaddhafi, 60; Ghadaffy, 60; Qhaddafi, 39; Qhadaffi, 33; Khaddaffy, 29; Gadhafy, 29; Kadhaffy, 28; Gaddhaffi, 27; Gaddaffy, 24; Qhadafy, 24; Qadhafy, 24; Ghaddhafi, 20; Kaddaffy, 20; Qhaddafy, 14; Kaddhaffi, 13; Khadhaffi, 10; Ghadhaffi, 10; Qhaddaffi, 9; Gadhaffy, 8; Kaddhafy, 7; Ghaddaffy, 4; Qaddhaffi, 3; Qhadaffy, 3; Ghaddhaffi, 2; Qhadhafi, 2; Gaddhafy, 2; Qaddhafy, 2; Qadhaffy, 2; Kaddhaffy, 1; Ghadhafy, 1; Qaddaffy, 1. Other spellings may exist. In May, 1986, when Khadafy responded to a letter from some second-graders at Maxfield Magnet School in St. Paul, Minnesota, he signed the letter in Arabic script, beneath which was typed "Moammar El-Gadhafi." This was the first known indication of his own feelings on the subject, and the wire services and many newspapers promptly announced they would switch. But Time and the New York Times remain holdouts [Charles Turner]. The only countries in the world with one syllable in their names are CHAD, FRANCE, GREECE, LAOS (one pronunciation), and SPAIN. There is also WALES, although it is not an independent country [Philip Bennett]. CONSERVATIONALISTS/CONVERSATIONALISTS is an example of a long transposal (words which are anagrams of each other). Some others are: INTERNATIONALISM/INTERLAMINATIONS, REPRESENTATIONALISM/MISREPRESENTATIONAL, CHOLECYSTODUODENOSTOMY/DUODENOCHOLECYSTOSTOMY, HYDROPNEUMOPERICARDIUM/PNEUMOHYDROPERICARDIUM, and HYDROXYDESOXYCORTICOSTERONE/HYDROXYDEOXYCORTICOSTERONES [Craig Rowland, Charles Turner]. The longest "well-mixed" transposals (no more than three consecutive letters in common) are BASIPARACHROMATIN/MARSIPOBRANCHIATA (17 letters) and THERMONASTICALLY/HEMATOCRYSTALLIN (16 letters) [Dan Tilque]. The longest three-way well-mixed transposal is INTERROGATIVES/REINVESTIGATOR/TERGIVERSATION (14 letters) [Dan Tilque]. A 15-letter well-mixed transposal is MEGACHIROPTERAN/CINEMATOGRAPHER [Charles Turner]. The longest "perfectly mixed" transposals (no consecutive letter combinations) are NITROMAGNESITE/REGIMENTATIONS and ROTUNDIFOLIATE/TITANOFLUORIDE (both 14 letters) [Dan Tilque]. Contronyms (or contranyms) are words which have contradictory meanings. A list of such words is here. The two silent letters in CORPS are pronounced when a silent E is added to form CORPSE [Keegan Greenier]. CROMULENT is a word created by writer David X. Cohen for the TV show The Simpsons. It is now listed in Webster’s New Millennium Dictionary of English. It is one of 10 words created or made popular by the TV series, as described in this article. Allowing intervening punctuation, there is SAB-CAT (a saboteur) in W2 and W3 [Susan Thorpe in WordsWorth]. Proper nouns include ABCOUDE (city in the Netherlands), ZABCIKVILLE (city in Texas), and ABCHASIA (a small breakaway republic on the Black Sea which is or was part of the Republic of Georgia). There are also B. abchasica, C. abchasicum, and H. abchasicus, all three of which are botanical names for Paeonia Plants found in the Caucasus [Philip Bennett, Charles Turner]. BACED (urbandictionary.com) is the only word consisting of the first five letters of the alphabet, each occurring once [Yarlagadda police]. DEEDED has each of its letters appearing three times. Other such words are GEGGEE (the victim of a hoax), SESTETTES, ESSEES (OED), SEESES (OED), FEFFEE (trustee of public land, OED), SHEESHEHS (tobacco pipes, F & W) [Stuart Kidd]. When the guidelines for etymology in Webster’s Third were nearing completion, Gove took time out to add the story of dord to the lore of how things can go wrong in dictionary making. Dord was a word that had appeared spontaneously and had found a quiet niche in the English language two decades earlier. It was recorded in Webster’s Second in 1934 on page 771, where it remained undetected for five years. It disappeared from the dictionary a year later without ever having entered common parlance. The facts, which had been established years earlier through a search of company files, were as follows, as abridged from Gove’s explanation. The lack of an etymology for dord, meaning "density," was noted by an editor on February 28, 1939, when he was perusing the dictionary. Startled by the omission, he went to the files to track down what had happened and what needed to be done. There, he found, first, a three-by-five white slip that had been sent to the company by a consultant in chemistry on July 31, 1931, bearing the notation "D or d, cont/ density." It was intended to be the basis for entering an additional abbreviation at the letter D in the next edition. The notation "cont," short for "continued," was to alert the typist to the fact that there would be several such entries for abbreviations at D.
A change in the organization of the dictionary possibly added to the confusion that followed. For the 1934 edition, all abbreviations were to be assembled in a separate "Abbreviations" section at the back of the book; in the previous edition words and abbreviations appeared together in a single alphabetical listing (which is how they again appeared in the Third Edition.) But after the original slip was typed for editorial handling, it was misdirected. Eventually, it came to be treated with the words rather than with the abbreviations. Th editorial stylist who received the first typed version should have marked "or" to be set in italics to indicate that the letters were abbreviations (D or d). But instead, she drew a continuous wavy line underneath to signify that "D or d" should be set in boldface in the manner of an entry word, and a label was added, "Physics & Chem." Since entry words were to be typed with a space between letters, the editorial stylist may have inferred that the typist had intended to write d o r d; the mysterious "cont" was ignored. These errors should have been caught when the word was retyped on a different color slip for the printer, but they were not. The stylist who received this version crossed out the "cont" and added the part-of-speech label n for noun. "As soon as someone else entered the pronunciation," Gove wrote, "dord was given the slap on the back that sent breath into its being. Whether the etymologist ever got a chance to stifle it, there is no evidence. It simply has no etymology. Thereafter, only a proofreader had final opportunity at the word, but as the proof passed under his scrutiny he was at the moment not so alert and suspicious as usual." The last slip in the file -- added in 1939 -- was marked "plate change imperative/urgent." The entry was deleted, and the space was closed up by lengthening the entry that followed. In 1940 bound books began appearing without the ghost word but with a new abbreviation. In the list of meanings for the abbreviation "D or d" appeared the phrase "density, Physics." Probably too bad, Gove added, "for why shouldn't dord mean density?" A footnote indicates the excerpt above was based on Philip Gove, "The History of Dord," American Speech, 29 (1954): 136-8. 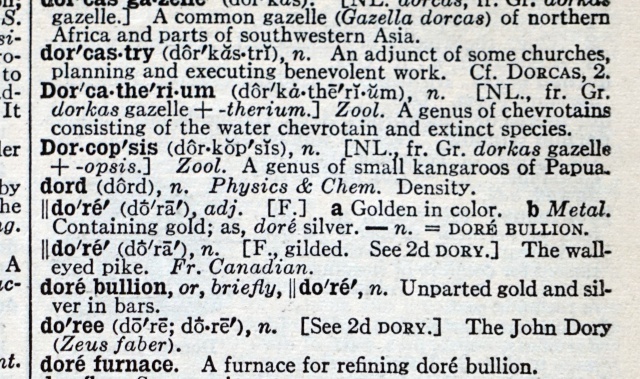 A video by Merriam-Webster on YouTube explains how dord made its way into the dictionary. Actually, there is a word dord — an ancient trumpet, originating in Ireland [Charles Turner]. Some non-existent places are GOBLU and BEATOSU, which appeared as towns on the 1979-80 Michigan State Highway Commission map; they actually represented Go Blue! and Beat OSU, and were deleted from the 1980-81 map [Dickson]. AGLOE was added to a road map of upstate New York in the 1930s by Otto G. Lindberg and Ernest Alpers, who anagrammed their initials to get the town name. (More information is here.) The non-existent town of ARGLETON in West Lancashire was found on Google maps in 2008 [Charles Turner]. SANDY ISLAND, which is found on Google Earth and other world maps midway between Australia and New Caledonia, was found in 2012 not to exist. See the Wikipedia article Fictitious Entry. Some surprisingly old words with the dates of the earliest known appearances in print are: ACID RAIN (1858), AMBULANCE CHASER (1896; see here), ANTACID (1753), ANTIVIRUS (1914), ATOMIC BOMB (1914), AUTOFOCUS (1917), BABE (1915, “She’s some babe.”), BOOZE (14th century, as a verb), BUG (for a technical flaw, 1876, by Thomas Edison), COCKTAIL (1803), DOOHICKEY (1914, spelled do-hickey), EARTHLING (1593), ELECTRONIC (1902, pertaining to the electron), EMBIGGEN (1884, by C. A. Ward in a British journal), EYESORE (about 1592, Shakespeare), FEMINISM (1841), FRIEND as a verb (13th century), FUNK (a strong smell, 1623; a state of panic, 1743), GEEK (1914, although with the definition “a carnival performer often billed as a wild man whose act usually includes biting the head off a live chicken or snake”), GINORMOUS (1942), HAIRDRESSER (1771), HANG OUT (1811 in A Dictionary of Buckish Slang, University Wit, and Pickpocket Eloquence and in 1836 in Dickens’ Pickwick Papers), HAS-BEEN (1606), HIGH (1627, Thomas May wrote, “He’s high with wine”), LEGIT (1897), HOME MOVIE (1917, “Home Movies! That’s what you and everybody can have now.”), MARTIAN (1395, although it meant “bellicose,” in Canterbury Tales), MILKY WAY (ca. 1384, but earlier in Latin), MOLE (in connection with espionage, 1622, by Sir Francis Bacon), NERD (1951), NOWHERESVILLE (1917), OY VEY (1914, spelled oy vay), PEP PILL (1917), POLAR VORTEX (1853), PUKE (1600), SNAIL MAIL (1982), SPACESHIP (1894), TIME TRAVELER (1894), YAHOO (1726), ZANY (1595-1596 in Shakespeare’s Love’s Labour’s Lost. The earliest known use of OMG is in a 1917 correspondence from British Admiral John Arbuthnot Fisher to Winston Churchill, wherein Fisher excitedly relayed the phrase to his former Royal Navy colleague: “I hear that a new order of Knighthood is on the tapis—O.M.G. (Oh! My God! )—Shower it on the Admiralty! !” See this web page. MS. has been dated to 1901. An earlier use of Ms. is on a 1767 tombstone in Plymouth, Massachusetts: "HERE LIES INTERRD [sic] THE BODY OF MS. SARAH SPOONER." However, it is considered a likely mistake by the engraver of the tombstone. See this article. MULTIVERSE was used in 1895. See this article. A 2002 New York Times article points out that John A. Murphy is credited with a 1972 marketing masterstroke with "Lite, a fine Pilsner beer," but that the OED shows a use of leoht beor in about the year 1000. According to a 2005 column by William Safire, the phrase INTELLIGENT DESIGN appears in an 1847 issue of Scientific American, but it was probably coined in its present sense in Humanism, a 1903 book by Ferdinand Canning Scott Schiller: "It will not be possible to rule out the supposition that the process of evolution may be guided by an intelligent design." According to Time (July 3, 2006), LUNATIC FRINGE was coined by Theodore Roosevelt in a letter he wrote after losing the 1912 election: "The various admirable movements in which I have been engaged have always developed among their numbers a large lunatic fringe." Some dictionaries state that J. R. R. Tolkien coined HOBBIT in 1937, but the word has since been found in 1895 in the Denham Tracts. According to this article, Jane Austen (1775�1817) used the phrases SHUT UP, DIRT CHEAP, DOG TIRED, DINNER-PARTY, and BRACE YOURSELF. The last two appear in her 1815 novel Emma. She also came up with the phrase, “If I’ve told you once, I’ve told you 100 times.” She is quoted 1,640 times in the latest edition of the OED. A perhaps surprisingly recent word is SCIENTIST, coined in 1834 by William Whewell. The OED has a citation of BAD, meaning good, from 1897 [Charles Turner]. TWERK was added to the Oxford English Dictionary in 2015. Research by the OED has found the term was first used in 1820 as a noun spelled twirk, meaning “a twisting jerking movement” or “twitch.” It then emerged as a verb by 1848 and the modern spelling was adopted by 1901. MATRIX, BUSYBODY, CASTAWAYE, BROKEN HARTED, LONGESUFFERINGE, and STOMBLINGE BLOCKE appear in William Tyndale’s translation of the Bible. An article listing surprisingly old words is here. The original source for these two lists included i as both a short and long letter. gyp and gyppy (in OSW and OED2) consist only of letters with descenders. Some words with only "up" letters are tikitiki (W2), libidibi (W2), dikdik, titbit, and tidbit. OED2 also has the obsolete biddikil and tittifill and the variant spelling hiddill. [Mike Turniansky, Jim Cook, Stuart Kidd, Rex Gooch, and Philip Bennett contributed to the letter-size section]. ESCALATOR is one of many words that were originally trademarks but have become ordinary words found in dictionaries. Some other words which were originally trademarks (or still are) are AQUA-LUNG, ASPIRIN, AUTOHARP, BAKELITE, BAND-AID, BREATHALYZER, BUBBLE WRAP, BVD, CELLOPHANE, CELLULOID, CHAPSTICK, CORNFLAKES, CROCK-POT, CUBE STEAK, DACRON, DEEPFREEZE, DICTAPHONE, DITTO, DRY ICE, DUMPSTER, FORMICA, FRISBEE, GED, GRANOLA, GUNK, HEROIN, HULA HOOP, JACUZZI, JEEP, JELL-O, JET SKI, KEROSENE, KLEENEX, LANOLIN, MACE, MIMEOGRAPH, MOXIE, NOVOCAIN, OUIJA (BOARD), PABLUM, PHILLIPS SCREW, PING-PONG, PLEXIGLAS, POGO STICK, POPSICLE, POST-IT, POWERPOINT, PYREX, Q-TIP, REALTOR, ROLLERBLADE, SCOTCH TAPE, SEEING EYE (DOG), SHARPIE, SHEETROCK, SLIP'N SLIDE, STETSON HAT, STYROFOAM, TABLOID, TARMAC, TASER, THERMOS, TRAMPOLINE, TUPPERWARE, VASELINE, VELCRO, WEED EATER, WINDBREAKER, YO-YO, ZAMBONI, ZIPPER. In addition NYLON was coined by du Pont, although the term was never trademarked [Dan Tilque, Charles Turner]. An entire book that does not use the letter e, a novel titled Gadsby, was published in 1939. Some interesting information about the book is here. Inspired by that book, Yarlagadda Police wrote a short play titled Man, God and the Eco which consists entirely of three-letter words. According to the author, the play consists of 3456 words, or 789 uniquely-appearing words. EWE and YOU are pronounced exactly the same, yet share no letters in common. Other examples: EYE/I, OX/AUKS, OH/EAU (de cologne), A/EH, AWE/OR (Australian pronunciation), AYE/I, COUGH/KAF (kaf is a variant of kaph), QUAY/KI (a Polynesian palm), EYE/AI (three-toed sloth), FEE/PHI (Greek letter), KEY/CHI (Greek letter), OZ/AAHS, CEE/SI, HAUT/OWE, WAY/HUE (city in Vietnam), SHE/XI (a river in China) [Dan Tilque, Chris Hendricks, Stuart Kidd, Philip Bennett, Don Kersey, Dmitri Borgmann, Eric Brahinsky]. FICKLEHEADED and FIDDLEDEEDEE may be the longest words consisting only of letters in the first half of the alphabet. Ted Clarke suggests ILLEFFACEABLE, although he admits this word is not in dictionaries. CABBAGEHEADED is found in print [Gary Rosenberg]. HIGGLEHAGGLED and GIBBLEGABBLED are given by Dmitri Borgmann in Charles Bombaugh’s Oddities and Curiosities of Words and Literature, ed. Martin Gardner. The Rec Puzzle Archives gives HAMAMELIDACEAE. Allowing proper names, BAECCICIELGEJAKKA (17 letters) is the name of a stream in Norway [Susan Thorpe]. Some shorter words are ACADEMICAL, ALCHEMICAL, ALKALIFIED, BACKFIELD, BACKFILLED, BEMEDALLED, BLACKBALLED, BLACKJACKED, BLACKMAILED, BLEACHABLE, DEACIDIFIED, DEADHEADED, DECALCIFIED, FEEDBACK, FIDDLEBACK, FIDDLEHEAD, FLIMFLAMMED, HIGHBALLED, HIJACKED, IMMEDICABLE, MACADAMIA, and HIJACKED [Stuart Kidd, Philip C. Bennett]. Some long words consisting of only letters in the second half of the alphabet are NONSUPPORTS, PUTTYROOTS, POPPYWORTS, SYNSPOROUS, NONTORTUOUS, SOUPSPOONS, PROSUPPORT, and ZOOSPOROUS [Marc Broering, Stuart Kidd, Philip C. Bennett, Paul Wright]. Allowing proper names, there are TUTTOQQORTOOQ (13 letters, an island in Greenland) and ROSSOUWSPOORT (13 letters, the name of a pass in South Africa) [Susan Thorpe].